There has been a great deal of news coverage about the recent Tax Cut and Jobs Act. But as with all things related to the tax code, getting to what matters can be a long and arduous hunt. The Polyisocyanurate Insulation Manufacturers Association (PIMA) made an assessment of the impacts this legislation will have on the building and roofing industries. It found that new reforms allow qualifying building owners to expense, or deduct, up to $1 million for the cost of certain building improvements in the year the work is performed, including adding insulation during roof replacement projects to meet or go beyond modern building energy code requirements. The impact can be significant for capital improvement projects. For example, a building owner that expenses the cost of a full roof replacement can reduce the net cost of the entire project by 25% to 30%. You can find our one-pager with more detail [here]. The Air Barrier Association of America (ABAA) evaluated and listed the Rmax ECOMAXci Wall Solution for use in commercial buildings. “The ECOMAXci Wall Solution is an insulated water and air barrier system designed to meet the most advanced building codes for water, air, fire and continuous insulation in commercial buildings,” said Martin Heiskell, Rmax president and COO. The system was rigorously tested by independent laboratories and was evaluated and listed to meet all NFPA 285, ABAA Air Barrier Assembly and ICC-ES Water-Resistive Barrier acceptance criteria. 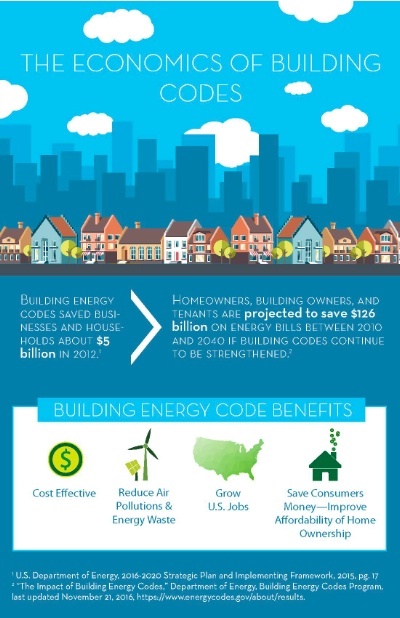 Adopting and enforcing building energy codes reduces the energy use of homes and buildings. Energy conservation is a major purpose of the International Code Council’s International Energy Conservation Code and ASHRAE’s Standard 90.1 – Energy Standard for Buildings, and adherence to these codes reaps sizeable savings. The U.S. Department of Energy estimates that model energy codes for residential and commercial buildings are projected to save (from 2010-2040) $126 billion at today’s energy prices and they can reduce annual CO2 emissions equal to 177 million passenger vehicles or 245 coal power plants. Productivity – GDP has grown 12% in the U.S. since 2007, while total energy use has fallen nearly 4%, meaning the energy productivity of the U.S. economy grew 16% over the past decade. Since 40% of energy use is attributed to buildings, it is clear that improved codes have spurred growth since less money spent on energy means more money invested in local communities and jobs. Affordability – Energy efficiency protects consumers from spikes in energy bills during a sweltering summer or frigid winter. Studies show that default risks are 32% lower in energy-efficient homes. Energy efficiency improves communities and home values by managing monthly energy costs and improving homeowners’ ability to meet monthly obligations. Reliability – Buildings are energy hogs: they use 75% of all electricity produced in the US. Aging energy infrastructure increases vulnerability to blackouts and security threats. Every building that limits energy usage also decreases our reliance on overworked grids. Building energy codes are an intuitive policy option to lighten the energy load. Resiliency – Weather related emergencies seem increasingly common and exact tolls on the homes, schools, and hospitals we rely on for safety and protection. The adoption and enforcement of energy codes makes buildings less susceptible to failure and quicker to recover after storms. For example, insulation in building envelopes improves the performance of roofs and walls in weather events. And energy-efficient buildings maintain a comfortable indoor environment when power for heating and cooling is limited or unavailable. Individuals – We are all trying to do more with less time. A recent study demonstrated that working in high-performing, green-certified buildings can improve decision-making in the workplace. In the study, the indoor environments of green buildings that operated within the thermal comfort zone as defined by ASHRAE resulted in higher cognitive function scores and better indoor air quality. The impressive number comes via a recent report by the American Chemistry Council (ACC) entitled, The Contributions of Insulation to the U.S. Economy in 2016. Unpacking the 400,000 jobs reveals an economic engine that produces more than $20 billion in payrolls, $1.1 billion in state and local taxes, and $1.9 billion in federal tax revenues. 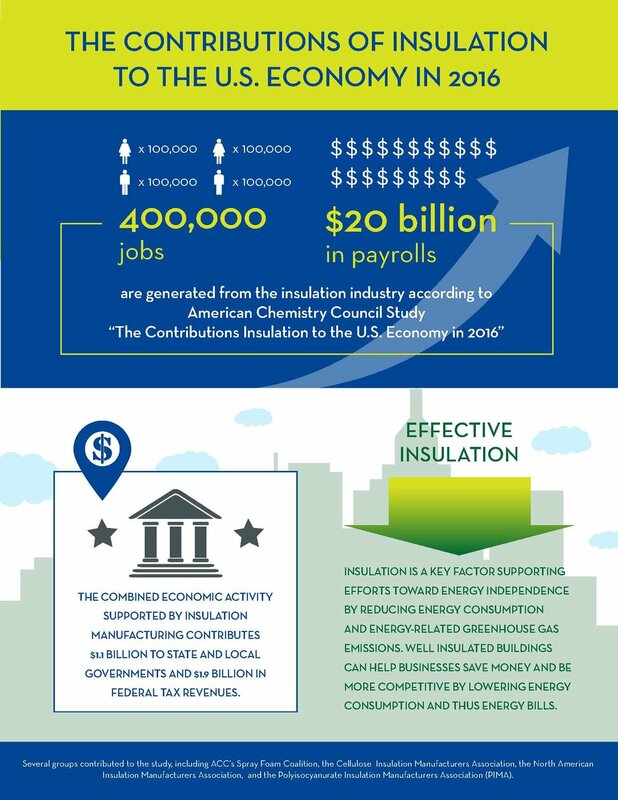 Insulation manufacturers directly employ more than 33,000 people in 42 states. The top five states for insulation manufacturing jobs are Ohio (#1), Texas (#2), Georgia (#3), California (#4), and Indiana (#5). California ranks number one for total employment in the insulation industry with over 54,000 jobs. "This report makes clear that the business of manufacturing, distributing, and installing insulation generates significant economic output and creates jobs across the country,” says Martha Gilchrist Moore, senior director of policy analysis and economics at ACC and author of the report. Underscoring this comment is the fact that insulation manufacturing alone was an $11.7 billion business in 2016. These jobs numbers are proof that the business case for energy efficiency products and projects is strong. Policymakers at the local, state, and federal should take note of the opportunity to create more well-paying jobs in the sector, while putting more money back in the wallets of households and businesses through increased energy savings.